Over time your project grows, and it can be hard to find quickly the important information. InLoox PM 8 provides you with the search feature in the project directly. It helps you to reach the needed data without a lot of digging. Use the Search project.... field that is on the top right of each project page. Enter the search term in the search field. On the Search tab, select Only this Page or All Pages. Select Enter or the search icon . The search results are shown on the right bottom. The list is subdivided into three columns Type, Name/Description and Found at. 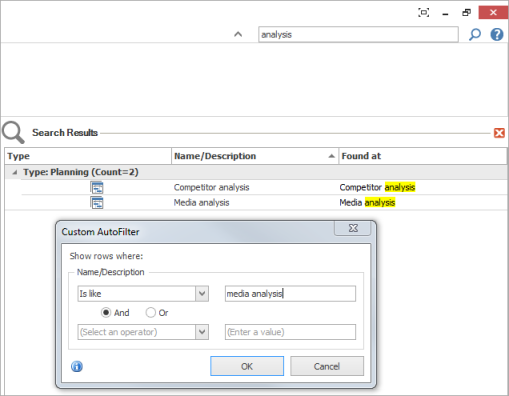 Refine your search by selecting one of the filters in the context menu in each coulmn: All, Custom, Blanks or Non blanks. Click Custom filter to select the custom filter in each column, e.g. Adjusted. Choose one condition, e.g. is equal. The default filter operator is and. You can combine two different logical operators by using the filter operator or. Enter a value in the field behind, e.g. analysis. InLoox PM filters the project by the selected criteria. You can further refine your search by clicking Only this Page or All Pages in the Section group, at the Search tab. Click discard icon in the search results list to clear your the search. Or click Close Search on the Search tab in the ribbon. To use the search results click the linked Type: information. InLoox PM for Outlook will switch to the page, where the result is saved. How to use the project search and filter | InLoox PM 8 • Copyright 1999-2019 © InLoox, Inc. All rights reserved.